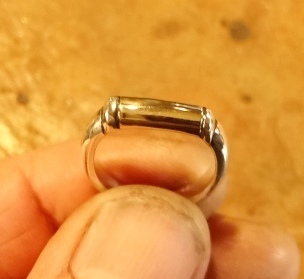 Silvio just finished a ring made from gold jewelry brought in by a customer from Underhill. As we have seen in the previous post, he melted the jewelry and re-shaped it into a new piece. Silvio promptly produced an assortment of small gems to examine. He can tell at-a-glance what will fit and what will not. “How about this one?” points the woman kindly. “No. It is too large. Here is a better one.” The jeweler’s eye turned caliper, and probably as accurate as any of today’s electronic devices, if not more, for he has the benefit of experience and instinct. It is interesting how, unlike many other jeweler’s shops, Silvio has configured his space so that visitors can approach the workbench. And indeed they feel at ease to do so. They are part of the process and the space invites the coming together of minds and ideas. How is this like melting gold? Somehow it is similar in some respect. An analogy. A metaphor. Ha! I’ve got it. The lover of fine jewelry and the master jeweler are the alloys that make up the creative substance. The fusing of their visions is the jeweler’s raw materials.